Give a three- to five-minute introduction of yourself to an audience such as your troop, class at school, or some other group. 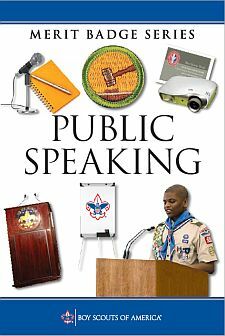 Prepare a three- to five-minute talk on a topic of your choice that incorporates body language and visual aids. Give an impromptu talk of at least two minutes, either as part of a group discussion or before your counselor. Use a subject selected by your counselor that is interesting to you but that is not known to you in advance and for which you do not have time to prepare. Select a topic of interest to your audience. Collect and organize information about this topic and prepare an outline. Write an eight- to 10-minute speech, practice it, then deliver it in a conversational way. Show you know parliamentary procedure by leading a discussion or meeting according to accepted rules of order; or by answering questions on the rules of order.